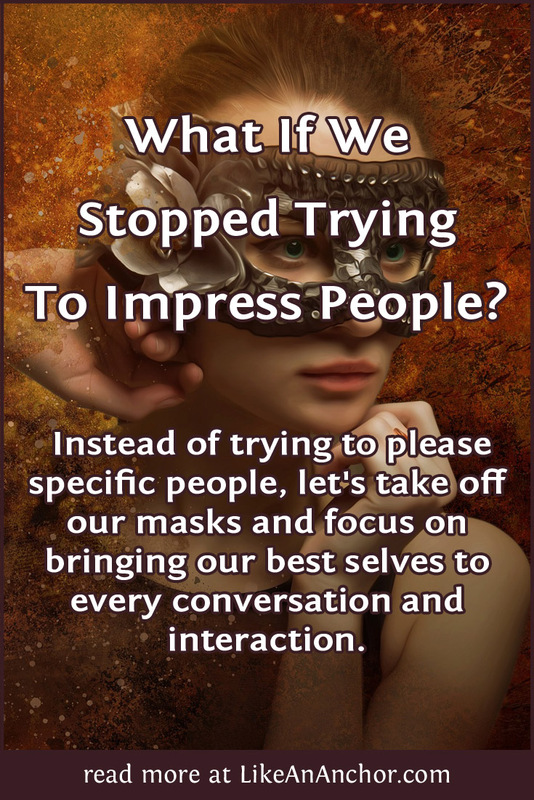 What If We Stopped Trying To Impress People? I like to keep the people around me happy. I want harmony in all my relationships, and I hate conflict. Take all those (along with a few other personality traits and some insecurities) together, and you end up with someone who’s been a “people pleaser” for most of her life. It’s normal for FJ personality types to act based on what will meet everyone’s needs and work to maintain harmonious relationships. That’s because they use Extroverted Feeling, or “Harmony,” as their decision-making process. But at some point in their personal growth journey, FJs need to realize that 1) you’re part of the “everyone” whose needs should be met, and 2) it’s impossible to please everyone. Since writing my post “Are You Ready To Find Your Weirdness?” I’ve been thinking about what effect embracing authenticity will have on interpersonal relationships. One of the things I’ve realized is that instead of trying to adjust my presentation of myself to impress specific people, I need to focus more on bringing my best self to every conversation and interaction. If they’re impressed by that, cool, but if not it’s okay. Failing to please everyone isn’t really failure at all. It’s just something that happens. It’s impossible to connect with everyone unless you’re adjusting yourself to please them. There’s far too much variety in human beings’ beliefs and preferences for your authentic self to resonate equally well with every person. In fact, if we’re being honest, I’m sure there are some types of people you don’t really want to resonate with. For example, you’d probably worry about yourself if a Klu Klux Klan member felt that you understood and agreed with them 100%. Taking a less extreme example, I’ve found myself in many conversations where I avoided speaking up about a topic and someone thought I agreed with them. I felt guilty for not sharing what I really believed, but didn’t want to risk the potential conflict of speaking up to correct their assumption. In casual relationships you can get away with this. The longer the relationship continues and the deeper it gets, however, the more obvious it becomes that trying to please everyone isn’t a viable plan. Being able to adjust yourself to your environment is a valuable skill. You don’t want to act the same way in a job interview with a Fortune 500 company as you would at a music festival. But you can be the professional version of yourself at the interview, and the relaxed fun-loving version of yourself at the music festival. You don’t have to leave all of your true self behind and play a different person in every setting just because you think that’s what others expect. It’s okay not to blend-in all the time and to express ideas that differ from those of the people around you. It’s exhausting to fake being “normal” (whatever that means). It’s also exhausting to go through life as a chameleon. Embracing authenticity can be scary, especially if you’ve been people-pleasing for so long that you’re not quite sure what authenticity means for you. But it’s worth the effort. I said at the beginning of this post that instead of trying to impress specific people, I want to focus on bringing my best self to every conversation and interaction. I hope you’ll join me in taking off our “masks” and letting people see who we truly are. I’ve done this a lot as a female intj. Only now am I beginning to become comfortable with sharing my thoughts with people but it’s still very limited. I tend to choose who I share anything with very carefully as I weigh whether or not it’s a waste of my time, like talking with an invalidater or a me monster. Now, I am feeling like I have a bit of the opposite problem: being too honest. I see this as a thing that can happen to an INFJ too if you’re scorched too early by the consequences of being too agreeable. In many cases, the forthrightness is not welcome by others and we end up offending a whole lot of people. It’s a phenomenon I am still trying to observe within myself, research, and moderate. I enjoyed the exploration of Jung’s personality types in this article and wish you luck on engaging a deeper meaning of Self. It is a worthy and lifelong journey. If we look specifically at the theory of types, each level reflects a personae that we adopt to engage the outside world. However, to realize a deeper meaning of Self, not the masks our ego adopts, we must round out the personality by adopting levels of the other traits. Therefore the extravert must go within to touch upon the realm of the introvert and vice versa. Pure feeling must make space for reflective thought to arise and judgment must find its root in perceptual reasoning. I enjoyed this article. Carpe Diem!